A cardboard box has the potential to be so much more, at least from a child's perspective. 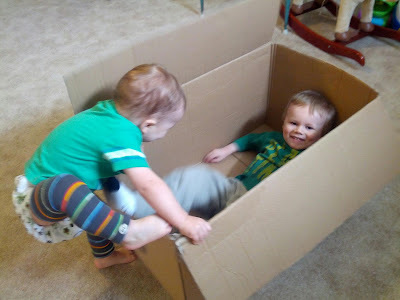 So whenever I end up with a large cardboard box in my recycling, I give the boys (and the cats too!) a chance to play. However, when I came across this homemade elevator buttons activity, I just knew that I had to turn the box into an elevator. My kids love to ride in an elevator. They love cardboard boxes. 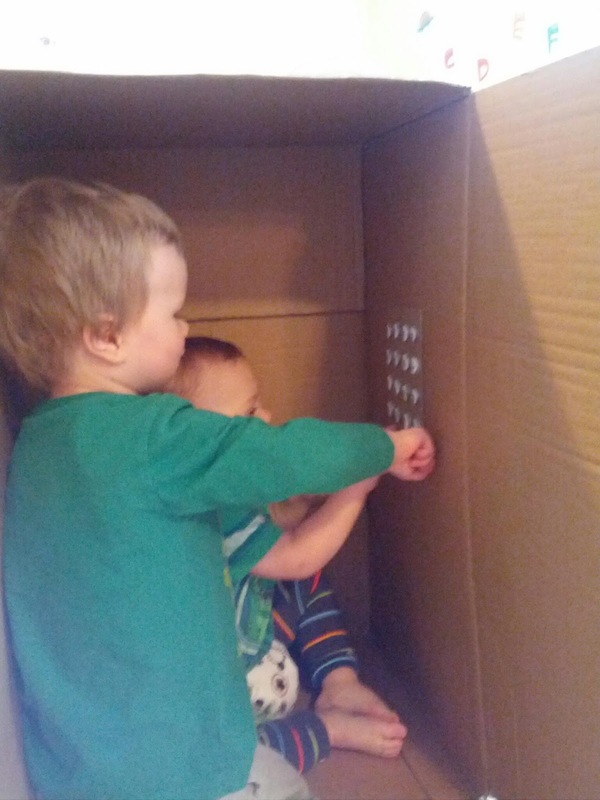 Elevator + cardboard = guaranteed fun! Scrap of cardboard - I used a piece of a cracker box. Two bottle or milk jug lids - I used milk jug lids. 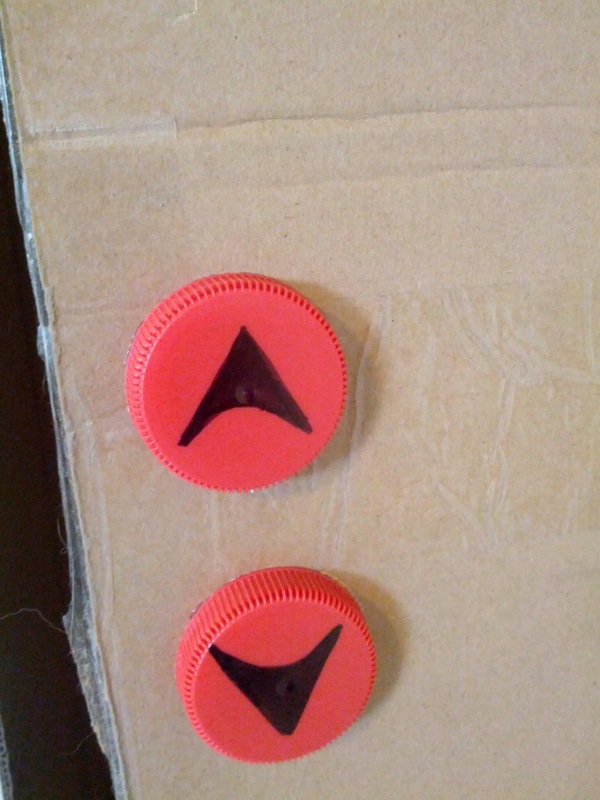 20 large googly eyes - They make perfect buttons as they bounce back after being pressed. 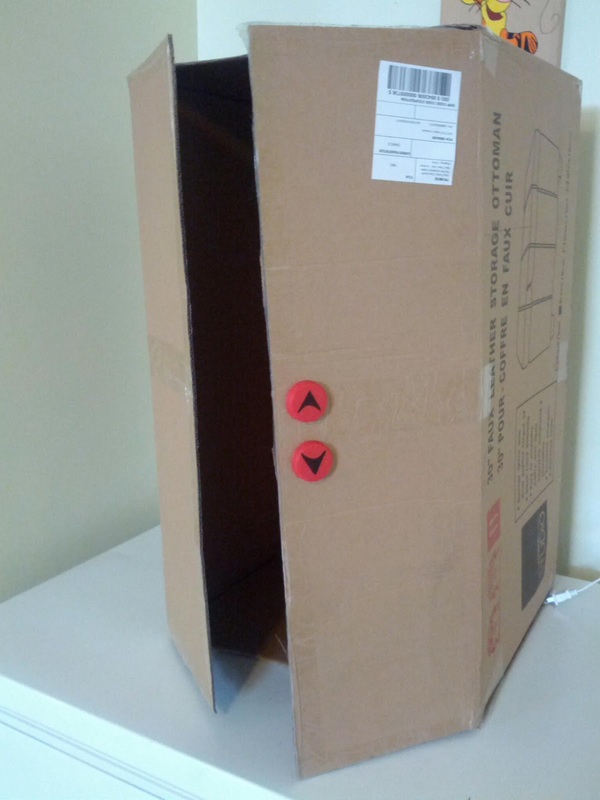 Cut off the two flaps of cardboard that would be at the top and bottom of the elevator door. Using the permanent marker, I drew an up arrow on one milk jug lid and a down arrow on the other lid. 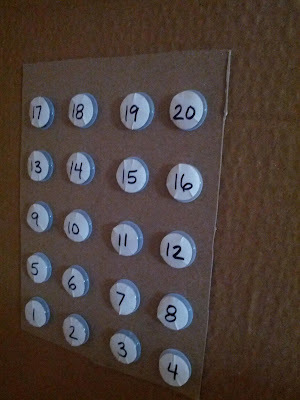 I then hot glued it to the front of the elevator door. Write the numbers 1-20 on the white labels. You can chose to do more or less if you want. Stick the labels on the googly eyes. Hot glue the googly eye buttons to the scrap of cardboard. 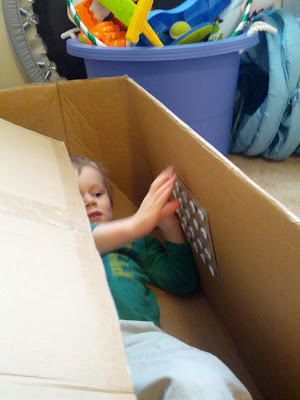 Then glue the cardboard scrap to the inside of the box. 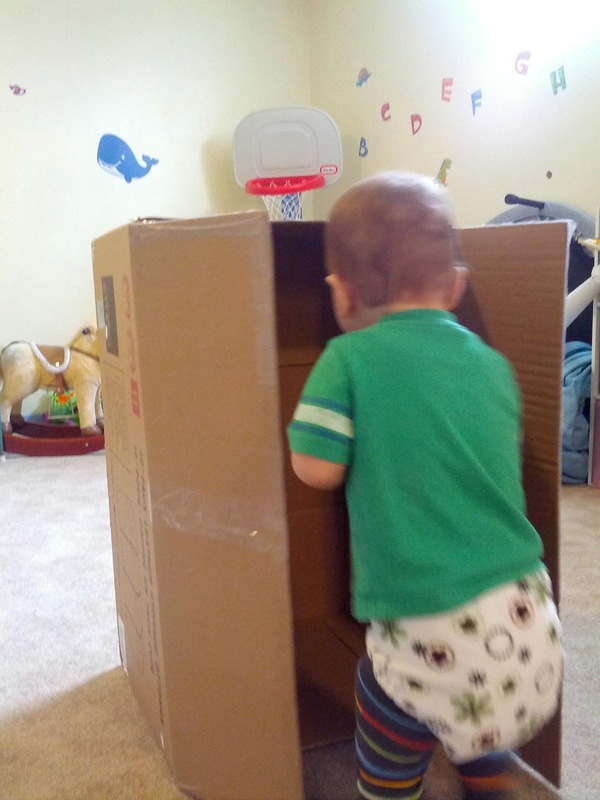 I set up the elevator in the playroom, just waiting to be discovered. K was the first to spot it and he literally squealed with delight. K sees the box and is so excited that I couldn't get a clear picture. Then J started to take over the elevator, refusing to share. Ah, three year olds! Then J leans back in the elevator, turning it into an elevator bed. He even brought a blanket into the elevator, closed the lid, and said, "Goodnight!" 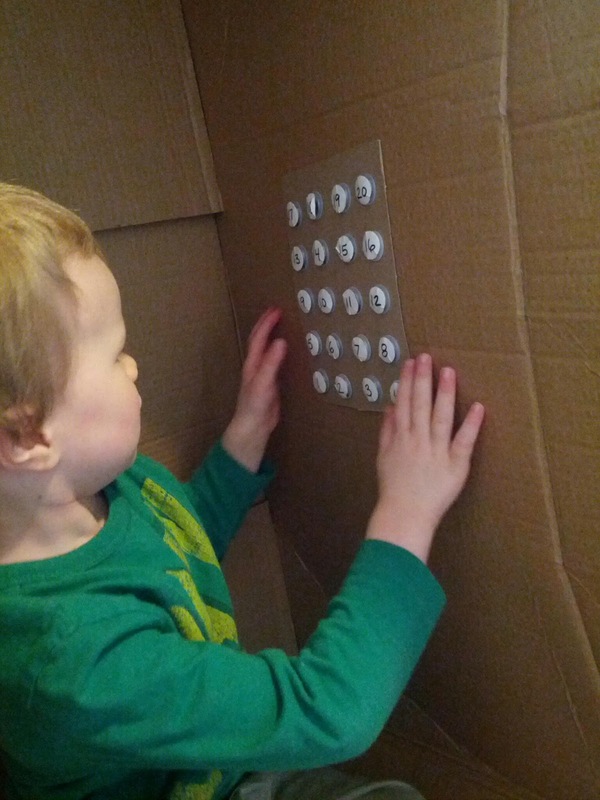 The elevator was a blast and led to lots of imaginative play. Awesome! The "buttons" are the best!